For clients that commit to more hours we like to reward them with a lower hourly rate. 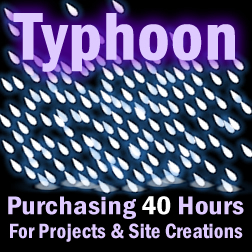 With the tried and true Typhoon Maintenance Package brings in a competivite rate of $50/hour for experienced web design and develpment services for WordPress websites. It's ideal for companies that require alot of updates or run multiple websites needing regular maintenance. With this plan you'll receive 40 hours broken down into 160 time intervals (intervals = 15 minutes). This package can be used on multiple small projects, a big one, or building a custom designed website to suit your needs.